Burgess first studied Shakespeare’s poetry and drama while a student at Xaverian College in Rusholme (1928-1935). He recalls his first reading of Venus and Adonis as being an emotional experience. Although he was immediately struck by the poem’s sensuality, Burgess later identified an autobiographical element in the poem’s setting in the English countryside and its central characters: Adonis is wooed by Venus, as Shakespeare was by Anne Hathaway. For Burgess, it was impossible to understand Shakespeare’s work without first understanding his life. Shakespeare the man – his background, influences and aspirations – could not be divorced from Shakespeare the artist. 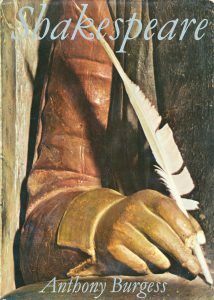 In 1958, writing as John Burgess Wilson, Burgess published a history of English Literature in which he provides an overview of Shakespeare’s works within the context of Shakespeare’s character, aspirations and experience, in order to “understand [the plays] better for getting ‘inside the skin’ of the man who wrote them.” Burgess’s Shakespeare was a man of the provinces who sought to transcend his working class origins and gain the trappings of gentility through education and sheer hard work. He was an outsider; an actor and writer for hire, with an eye on the ‘here and now’, rather than posterity; a lover of language; an astute observer of humanity and able articulator of what it is to be human. These traits formed the basis of Burgess’s enjoyment of Shakespeare and his identification with certain aspects of his life and character. Burgess’s response to Shakespeare’s works was typically creative and wide-ranging, encompassing his literary, poetic, dramatic, musical, and journalistic output.